Can you believe it's July already? Less than 6 months of shopping days until Christmas... oops. I bet that was the last thing you wanted to hear. What you do really want to hear is how to do a fun, easy, edible craft for the 4th of July with your kids. We got the idea out of our family fun magazine last year and it was a big hit with the girls. Not to mention you only need a few things. 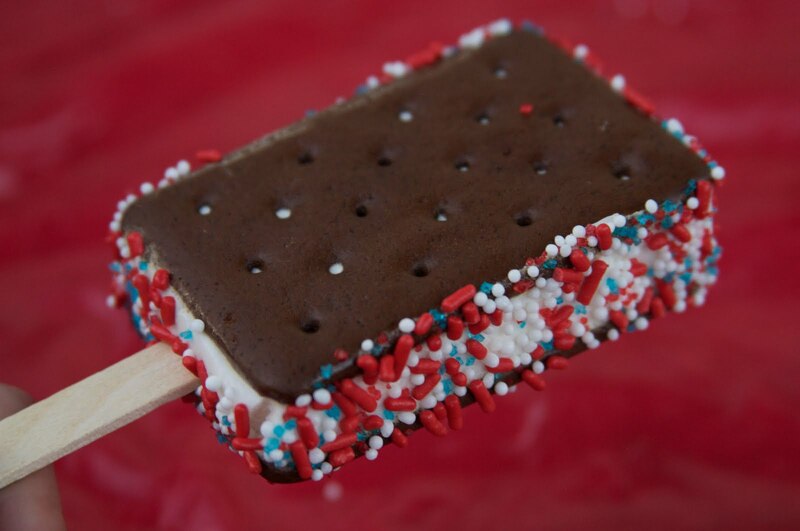 First unwrap your mini ice cream sandwiches (as many as you are going to make at once). You have to work quickly because it's summer, it's ice cream, and like the Wicked Witch of the East, it's MELLLTING.... Quickly place the wooden sticks firmly into the base of the ice cream sandwich. By the way, Family Fun says to make them all cute and put them in cupcake wrappers. I found it more practical to just make them right before you plan to eat them. Next get a paper plate (you will thank yourself a thousand times over when the sprinkles won't fly all over the place). Pour in the fun Patriotic sprinkles while big eyes watch your every move. All you have to do after that is dip (pressing slightly) all the exposed sides in the sprinkles. A pretty treat in the colors of America (or Great Britain, or France, or Norway, or the Czech Republic... hey these would work for school colors, any holiday colors, birthday party colors),! The only thing left after that is to ENJOY! And enjoy, they did! Have a happy, fun, safe, 4th of JULY! I feel my patriotic pride rise while eating these! Treasure Maps - X Marks the Spot!